The Large Munsterlander possesses a well-balanced conformation suggestive of easy, steady movement and drive. The breed's head is sufficiently broad and slightly rounded, giving an impression of stability, even dignity. Solid black with a white snip or star is allowed. The body is white with black patches, flecked and/or ticked. An all-black coat is not desirable to breeders. Brown coats do occur, but are not common. Its broad, round-tipped ears hang close to the head. It should have a scissors bite. The eyes are dark and heavy lidded. The coat is long and dense, neither curly nor coarse. It has feathers on the ears, front and hind legs, and tail. There should be no feathering on the backside of the upper feet, so that you can see the 90-degree angle. Males usually have larger heads, longer hair on the chest and more feathering than females. When the dog stands, his extended hind feet should stand in a right angle to the ground. It has firm, strong feet with ample hair between the black-nailed toes. The tail is carried horizontally and may be left intact or have a just a tiny bit of the end removed. The Large Munsterlander has an elegant gait. The Large Munsterlander is courageous, cheerful, intelligent and obedient. It makes a wonderful house companion dog and is very trainable. Munsterlanders are loyal and friendly dogs that are responsive to their humans. They make very good friends. If the Munsterlander is lacking in leadership and/or mental and pysical exercise it can get destructive and bark when left alone in the house. They are not guard dogs. They like to retrieve and naturally like to carry things about in their mouths. The Munster does well in obedience, and is good with other animals and with children. Under-exercised Munsterlanders can get overly excited and high strung. They will be happiest when used as working dogs. Bred for training and ability to withstand the pressures involved, this dog will adapt to any terrain whether it be valleys, prairies, forest or water, and to every type of hunting. It is resistant to fatigue and to bad weather. Particularly appreciated for the sureness of its point and the precision with which it retrieves, the Munsterlander can easily learn to come and sit on command in the first six months of life. Proper human to canine communication is essential. They love water and will try to retrieve everything out of the water. They are not difficult dogs. If one has a firm hand, even a beginner can manage this breed without a problem, however, they must remain firm, but calm, confident and consistent throughout the dog's life. It is a slow maturing dog, so don't "over-train" in its field work at too young an age. The breed has shown itself to be a dedicated enemy of birds of prey and they may try to attack small farm animals, however they can be trained to leave sheep and cattle alone. Although he will chase every small rodent and bird, he can't be bothered to chase cars, joggers and bikes. When he spots a bird or rabbit he will usually freeze in his motion. His head will point toward the prey and his whole body shifts slightly forward; one of the front feet will often be off the ground. The rapid motion freeze will prevent the prey from being alarmed and shows the hunter where the prey is hiding. The position can be often seen in old pictures and paintings and is typical for breeds such as pointers. Described by the German word "Vorsteh" (hund). The Large Munsterlander is not recommended for apartment life. It is moderately active indoors and will do best with at least a large yard. The Munsterlander wants to play when it is outdoors. One owner of a Munsterlander says, "When they are not sleeping, they usually play with a bone or toy." As with all their hunting relatives, they require sufficient exercise, although not as much as a pointer. They need to be taken on a daily, brisk walk or jog. While out on the walk the dog must be made to heel beside or behind the person holding the lead, as in a dog's mind the leader leads the way, and that leader needs to be the human. In addition, they need to be active in some type of work or play each day so they can run. They love to be outside and run around free. They are in their element when hunting rabbits or deer. Munsterlanders will search for rabbits under every bush they can find. This is not a dog for older or inactive people. It will do best with people who love to be outdoors. In the late 18th century, Germany's interest in bird dogs brought countless Huehnerhunde (meaning chicken dog) into the hands of hunters. The Large Munsterlander, also known as the Grosser Munsterlander Vorstehhund, although a German bird dog, has not been around quite that long. It evolved in Munster, Germany, from its smaller cousin in the 1800s—because at that time only the liver and white dogs that were descended from the German Long-Haired Pointer were accepted. This breed then is easily distinguished from the Small Munsterlander not only by its size, but by its black and white coloring as well. 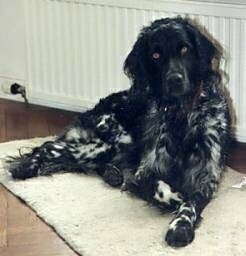 Its excellent nose properly indicates the correlation to the Lower Saxon area; its similar conformation to the German Longhaired Pointer and Continental setters suggests that connection as well. The German Pointer fanciers traditionally seem to ignore black-colored progeny. This controversy occurs in the Longhaired and Wirehaired Pointers. Many insist that the Grosser Munster was once simply the black and white Longhaired Pointer. The club was formed in 1919 and hails its dog as an all-purpose hunter, capable of pointing, retrieving and general utility work. It is becoming increasingly popular outside its country of origin. 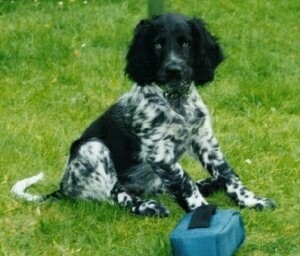 It has always been used as a retrieving dog and it tracks and points game as well. In its work it is fearless and tireless, being able to work in all kinds of terrain and weather. In England it competes with other continental gun dogs in the HPR (Hunt Point Retriever) Field Trials. 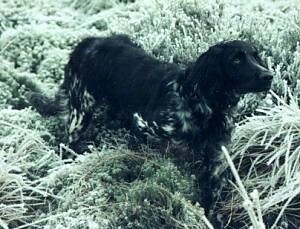 Although there are not many around, this breed is a recognizable and valued hunter in England, Germany and Canada. They are reliable on both land and water. This is Timo, a Large Munsterlander. Photo courtesy of Andreas Gortz. Thank you, Andreas, for helping with the information on this page.